Are you letting your shyness keeping you from doing craft shows? I know I used to. I was worried about what to say to people. I was worried about people telling me how horrible my work was. Guess what? I figured out what to say and no one told me my work sucked. 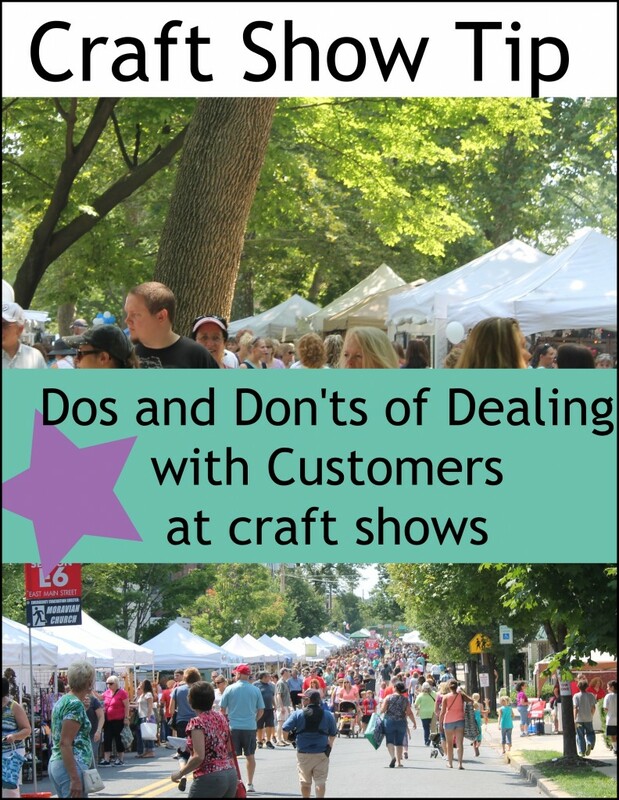 Here are some dos and don’ts of dealing with customers at craft shows. Greet each person walking into your booth. I found it helpful to have a few things ready to say, such as “Good morning.” “How are you doing today?” or “If you have any questions, I’m happy to answer them.” As you get more comfortable, you can add some more things specific to your artwork, maybe letting them know it’s all handmade by you. Be friendly and cheerful, but not fake. If someone is interested but looks like they’re afraid to touch something, put it in their hand. If you’re selling jewelry ask them if they would like to try it on. 9 times out of 10 once it’s on them (if it fits) they’ll leave it on and purchase it. Work on your artwork, but be ready to put it down at any moment to talk to or help a customer. Talk to neighboring vendors too much. Complain about the show to or in front of your customers. Ignore your customers in any way. Let your grouchy mood affect how friendly you are to customers. You can use the dos list above to get ideas of things you can always say without thinking too hard in case you are feeling moody. If someone does happen to say something negative about your work, don’t let it get to you. Not everyone will love you. Like these dos and don’ts? You’ll love my Craft Show Tips eBook. Read all about it and purchase it here: Craft Show Tips. Note about these craft show tips posts: I am combining my Craft Show Tip posts with my Jewelry Business Tip posts. They will be right here every Wednesday. Starting next week, Jewelry Business Tips will be weekly on Wednesday with a Craft Show Tip monthly (also on Wednesdays.) Sign up for the new combined email updates here. This entry was posted in Business, Craft Show Tips and tagged art fair, craft fair, craft festival, craft show tip, craft show tips, customers, dealing with customers by Kimberlie. Bookmark the permalink.